A radical Islamic cleric has gone on trial in Indonesia, charged in connection with the Bali nightclub bombings two years ago. 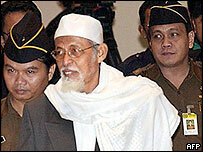 Abu Bakar Ba'asyir also faces charges over a Jakarta hotel attack in 2003. The 66-year-old cleric appeared relaxed as he arrived at the court in Jakarta. He proclaimed his innocence and berated US President George W Bush. Ba'asyir stands accused of being the spiritual leader of militant Islamic network Jemaah Islamiah (JI). The prosecution will argue that, in this influential position, he encouraged and facilitated those under him to carry out acts of terrorism. Some of the charges he faces could, if proven, carry the death penalty. Ba'asyir was acquitted of treason charges last year, after judges ruled that there was not enough evidence to link him to JI. But prosecutors now say they have further evidence to back up their case. The trial has been adjourned until next week. Wearing his trademark white scarf and white cap, Abu Bakar Ba'asyir entered the courtroom under armed guard. After a chorus of chants from his supporters, the cleric was given leave to speak. "Please remain calm," he said. "There are things in this indictment that we might not accept, but let God be our judge." "It's clear I'm not guilty. I'm sure," he added. Ba'asyir has often denied the charges against him - in fact he denies that JI even exists - and insists the trial is an American-led conspiracy. Before appearing in court on Thursday, he accused US President George Bush of being from "Satan America" and Australian Prime Minister John Howard of orchestrating the trial. But when the charges were read out to him, he said he did not fully understand what he was being accused of, according to the BBC correspondent at the trial, Rachel Harvey. The 65-page indictment accused Ba'asyir of heading JI, an al-Qaeda linked group blamed for a string of attacks including the Bali bombings, the Marriott Hotel attack and the suicide car bombing outside the Australian embassy in September this year. "The defendant... planned and or moved other people to conduct terrorism crimes... to create the atmosphere of terror, resulting in mass casualties," prosecutor Salman Maryadi told reporters. Mr Maryadi gave no details of what crimes Ba'asyir had planned, but said that when the cleric visited a JI militant training camp in the southern Philippines in 2000, his incitement prompted others to carry out the Marriott attack three years later. Mr Maryadi accused Ba'asyir of passing on an order from Osama bin Laden which "permitted the waging of war against, and the killing of, Americans and their allies". The indictment also said that two months before the Bali blasts, Ba'asyir met Amrozi, one of the men convicted of carrying out the bombings. Amrozi is said to have asked the cleric what he thought if "friends held an event in Bali". Ba'asyir allegedly replied that it was up to them. "Due to the calls from the teacher, these people then conducted bomb explosions in Bali," Mr Maryadi told the court. Ba'asyir is principally being tried in relation to the Marriott hotel bombing, under new anti-terror laws passed in the wake of the Bali attacks. This legislation cannot be applied retroactively, and he is therefore being charged with involvement in the Bali attack itself under Indonesia's criminal law, which requires a higher burden of proof to convict someone of terrorism offences. The case against Ba'asyir hinges on the prosecution's ability to prove he is or was the leader of JI. The judge in his previous trial last year ruled that, at that time, there was insufficient evidence to prove any such connection. But the police say they now have new witnesses to make their case, as well as new documents at their disposal. Our correspondent says that one such document is likely to be a JI guide found during a police raid last year.